As I work through this series on Basic Jewelry-Making, there are going to be subjects on which my knowledge is limited. 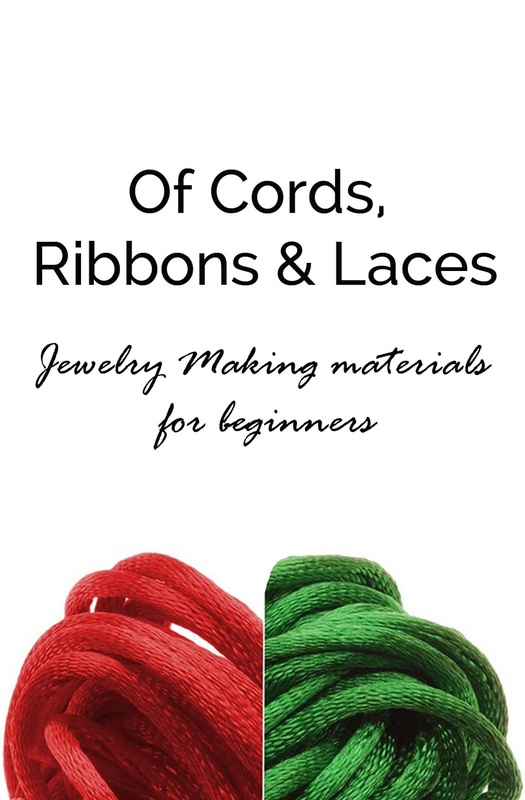 When I covered materials for jewelry-making, cording was an area that I left somewhat open. Divya from Jewels of Sayuri has kindly offered to guest post and fill in some of those blanks. Thanks to Divya! Here we go! The secret to unique jewelry designs is in how you select and put together materials. Apart from beads of various shapes and sizes, supplies that can significantly alter the look of your designs and add pizzaz to them are stringing materials. Stringing materials can be majorly classified as wire, cord, ribbon, lace and thread. Hope had previously covered wire classifications. In this post I will be covering those that come under haberdashery trims. Before we begin to source these materials, we must understand the difference between cords, ribbons, laces and yarn as these words are commonly interchanged. A Cord is a strong linear yarn like material that is normally round or square in cross-section. 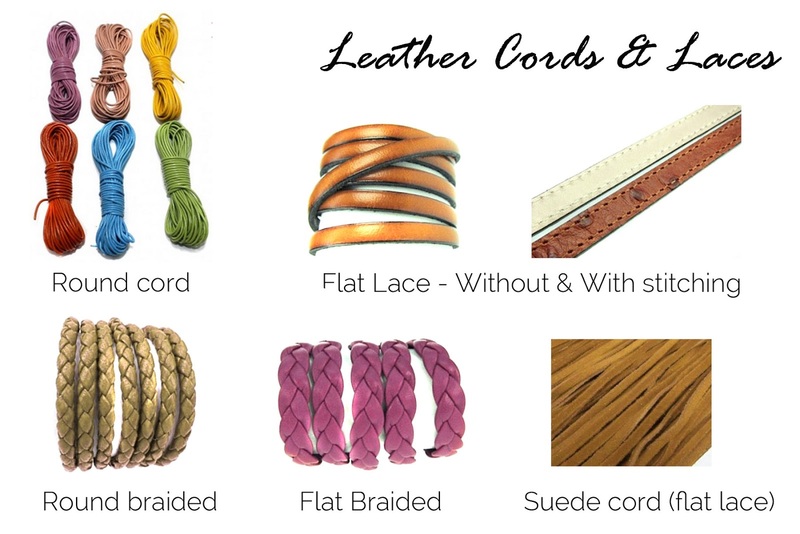 A cord can be plain or braided and it could be with or without stitching on one side. Cords could have a core material that is enveloped by an outer covering. A round leather cord or Regaliz (Portuguese Cork cord) enveloped by cotton fabric are good examples. Cords are used to string beads and pendants or used as tieups. Popular jewelry making cords include cotton cords, hemp cords, satin cords (rattail), and leather cords. Paracord (Nylon Parachute cord) is often used to make bold macramé bracelets. 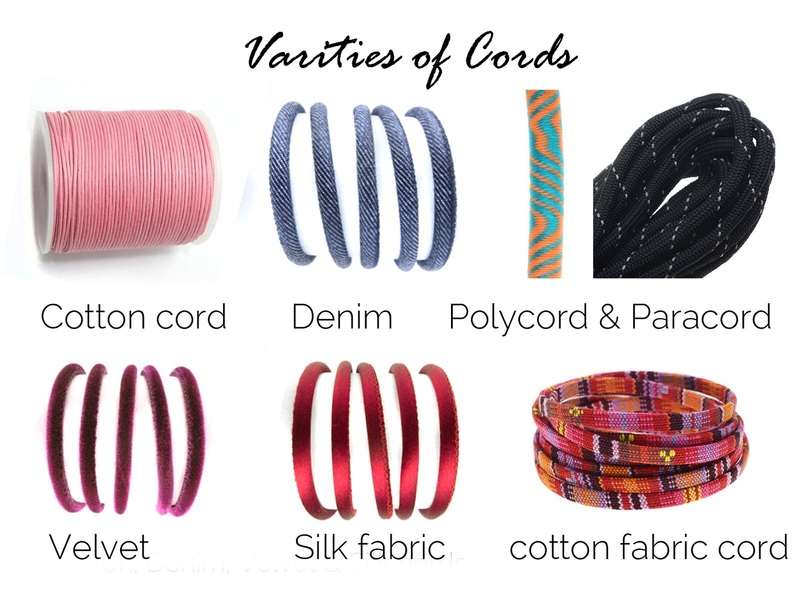 Newer entrants to the market are denim cords, velvet cords and silk fabric cords. A Lace is a flat (sometimes ruched) elaborately decorative trim that could be woven, knitted, or made using non woven techniques like crochet or needlepoint. It is a lightweight openwork structure patterned, either by machine or by hand. In Jewelry, laces are typically used to make Victorian Chokers and cuffs. These are tapes that are ironically referred to as Leather Lace even when they have no openwork pattern in them. They can be flat with a colored edge, braided or even simple lengths of suede. They are great for making wrap bracelets. Braids are trims that come under the non- woven category. Braiding is a technique that can be seen in cords and threads as well. Soutache thread is a narrow, flat braid trim in a herringbone pattern. 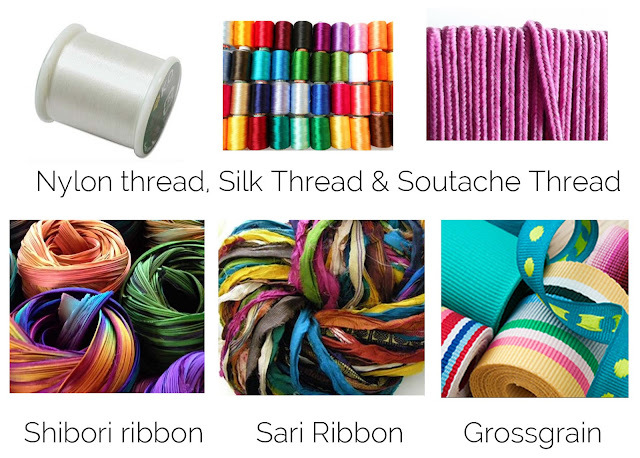 A Ribbon is flat and flexible mostly woven band often used in making bows and other small embellishments. Velvet ribbon, organza ribbon, satin ribbon or grosgrain ribbon are some commonplace examples of finished ribbons. However, you can cut any fabric into narrow strips to make ribbons. Sari Ribbon and shibori ribbon are made that way. If you want your fabrics ribbons to stretch and fray less, you can cut them on bias (45 degree angle). Alternatively, for a professional look you can get a ball hem, pico or overedge finish for the edges. A Rik-Rak (Ric–Rac) is a zig zag band that also comes under ribbons. Tapes are also flat trims much similar to ribbons. However, they are usually narrow unlike ribbons which can be even 3”- 4” wide. Tapes are also thicker and could be edged as in the case of leather tapes. Threads and yarns are fine string like materials that are used to create cords, ribbons or tapes. But they can also be used by themselves as stringing material or to create embellishments. Silk beading and knotting thread and transparent filament yarns are often used in beadweaving and beadwork. Yarn can be used to knit or crochet trims like rosettes. Pompoms can be made using woolen or acrylic yarn. Embroidery thread or silk thread could be used to make tassels or to wrap cords for bracelets and necklaces. Zari thread (combination of metallic yarn with silk or cotton thread) can add shine to your piece and make it feel luxurious. 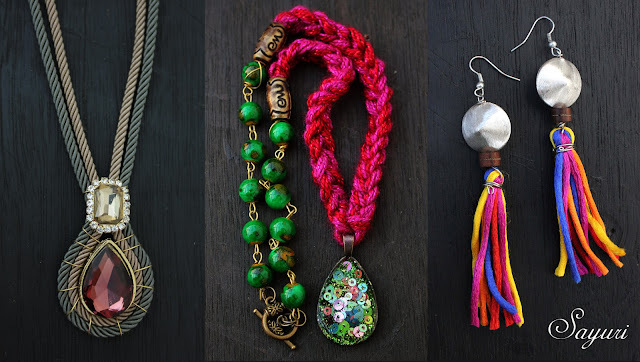 The world of fabric and fiber jewelry is vast and is waiting for you to explore. I have only written about the tip of the ice berg here. Though the wide array of available trims can make it confusing for a beginner, working with them can be truly pleasurable. As you embark on this journey, I invite you to visit my blog Jewels of Sayuri, facebook page, and Instagram handle for eclectic inspiration. Author Bio: Divya N is a Fashion and jewelry designer who loves to travel, read and sleep in. This amateur photographer and blogger from India spends her days teaching fashion communication. Huge thanks to Divya for sharing her knowledge and wisdom on this subject! Feel free to ask any questions you may have. And, as I go through this series, let me know if there's a topic you can cover in more detail than I have. I'm sharing this post at the Create Link Inspire Linky Party at The Crafty Blog Stalker and Recipe & DIY Linky at The SITs Girls. What a profound source of information, some of the materials I had never heard of or didn't know they were called that, take laces, for instance. It's such a good call, Hope! And thanks to Divya for offering to do this post! I think it's fascinating when people follow their passions and become experts in things most of us don't really think about. These photos are beautiful, and I'm so glad there are creative people like the two of you who help us all be prettier! Sparkle on!